Polybutylene | Sunstate Home Inspections, Inc.
Two studies in particular in papers published by the University of Illinois at Chicago have shown that certain disinfectants can react with the polybutylene and cause it to flake apart at any location within the PB piping system. Small fractures can deepen over time and eventually work their way to the pipe's exterior, allowing water to escape. Some manufacturers, however, claim that the majority of leaks occur at joints and unions, which is where a leak would likely appear if a pipe were improperly installed. Despite this contention, class-action lawsuits filed against PB manufacturers have been successful and resulted in payouts to homeowners reaching $1 billion. ½” to 1” in diameter. at the main water shut-off valve. Home inspectors are not required to note the presence of polybutylene, and no tests for weaknesses should be performed. Any deterioration of polybutylene pipes happens from within and cannot be detected without turning off the water and dismantling the pipe, which is far beyond the standards of practice of home inspection. Inspectors should check an entire pipe for PB, not just a portion of it. 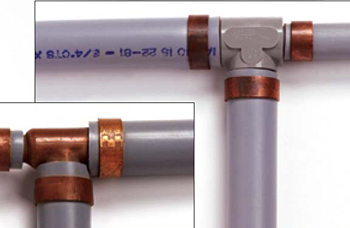 Some copper piping systems have been found to use PB at junctures. 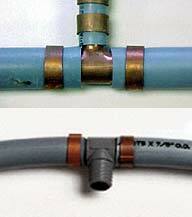 A common example of this union is where PB pipe links with copper “stub outs” that feed bathroom fixtures. 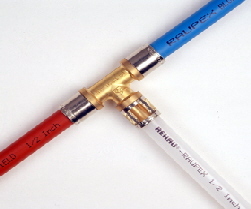 PEX (pictured at right): Common in radiant-heating systems, this cross-linked polyethylene can be black, blue or red. It is more easily coiled and more flexible than PB. It can withstand higher temperatures than polyethylene. PVC: A popular building material commonly used in residential plumbing. CPVC is derived from PVC and is also used in plumbing. 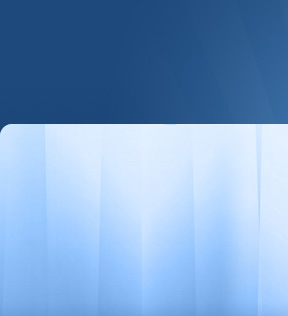 Both appear white or off-white and can be flexible or rigid. Polyethylene: This material is flexible and black. Copper: Copper is a metal that should never be confused with PB. If in doubt, a licensed plumber can be contacted to determine whether or not a pipe is made from PB.